ANKARA, Turkey - On June 7, 2015 Turkey went through general elections for a new government. The ruling party, Justice and Development Party (AKP), main opposition party Republican People’s Party (CHP), Nationalist Movement Party (MHP) and People’s Democratic Party (HDP) passed the10 percent electoral threshold, and got into the parliament, The Grand National Assembly of Turkey (TBMM). Despite receiving the highest percentage of vote, unlike the previous elections, AKP was not able to reach the number of parliament members to form a government alone and forced to form a coalition with one of the opposing parties. “‘No parties can form a government alone’ means political parties will come together and form a coalition. If no parties were authorized [by the people] to form a government alone, there is nothing more proper than having negotiations with other parties,” said Ahmet Davutoglu, chairman of AKP at the press conference following his final meeting with Kemal Kilicdaroglu, chairman of CHP on August 13, 2015. Following the elections, prime minister and chairman of AKP, Ahmet Davutoglu was appointed to form the coalition on July 9, 2015 by the president Recep Tayyip Erdogan. Ahmet Davutoglu and his government would also continue to hold a temporary government until a new coalition is formed. Having 40 business days to form a government, Davutoglu and his team met leaders of all three parties at TBMM to start negotiations for a coalition government. Initially turned down by both MHP and HDP, AKP focused on negotiations with CHP. Both parties formed commissions to discuss main expectations from a new government that could be formed by both parties. After the commissions met several times, a total hours of almost 35, to come to an agreement, the leaders of both parties Ahmet Davutoglu and Kemal Kilicdaroglu met on August 10, 2015 to finalize the negotiations. Not having come to terms, the two leaders scheduled to meet again on August 13, 2015. The two leaders met in the afternoon of August 13, at Ankara Palas, a historical building used as an official state guest house in the capital to finalize the negotiations. Following long, tedious and cautiously crafted negotiations, most people were expecting an agreement and the announcement of the new government with the coalition of AKP and CHP, two distinct voices in the parliament. Contrary to expectations, the final meeting did not end with an agreement. Both leaders expressed in separate press conferences that the parties were not able to some to terms to set a coalition government. Mr. Davutoglu said despite both parties had very hopeful approach to form the government, and everyone did what they were supposed to do, each party’s expectations for the country’s future did not come to a consensus to work together. “In my speech at AKP headquarters’ balcony on June 7th night, I had expressed that we will not let this country not have a government, we will not give a chance to those who want create a chaos or crisis, and we will take any necessary measures as a party that has the strength to govern the country any time. I am sure anyone who voted for us or not can see that we have been doing whatever is necessary for the responsibility we have taken on this issue for the past two months,” Mr. Davutoglu said. Following Mr. Davutoglu, Mr. Kilictaroglu said CHP has prepared its basic principles to form a coalition with 14 items on June 15, 2015 and shared them with public following the elections. He said, he expressed Mr. Davutoglu that CHP thinks a well grounded and powerful coalition formed for a long term would be best for country’s need. On the contrary, Davutoglu offered a short term government or asked for support for a minority government as a second option. Both leaders expressed there was no option for pessimism for Turkey. Davutoglu said there were still options such as forming a coalition with MHP, although an early election was prominently standing out. Kilicdaroglu said Turkey has the capacity to get over its problems. Over two months after the elections, a government not being formed, Turkey’s people are again at the edge of making a choice of who should govern the country. ANKARA, Turkey - In the previous analysis of the recent elections in Turkey, Recep Tayyip Erdoğan’s was largely to blame for the failure of the AK PARTİ or AKP party to maintain its majority control of parliament. There have been many elements affecting Turkey's populace deciding to vote along alternate party lines, but here are five that most heavily shaped the parliament in the Great National Assembly of Turkey (TBMM). Recep Tayyip Erdoğan is unarguably one of the most charismatic and authoritarian figures in all of Turkish political history. Being in politics since his youth, Erdoğan was able to win the hearts and minds of millions in the 2002 elections, although he was originally politically banned as a result of his conviction within the scope of what was known in Turkey as “Thought Crimes.” In reality, his conviction sparked off more support for Erdoğan as people thought he was banned unjustly. In addition to his outstanding political charisma, Erdoğan’s powerful speeches and rigid attitude also won general approval. This general approval continued to increase as the government, under Erdoğan’s rule, ran successful economical policies which increased people’s level of welfare. After being elected as a president in August 2014, Erdoğan’s position had become the most highly ranked - above all political parties. He was neither a prime minister nor a chairperson of AKP anymore. Erdoğan resigned from his positions in the AKP as well as the government, and handed over his reins to one of his closest allies in his party, Ahmet Davutoglu, to take over his previous position. Consequently, public’s support of AKP decreased in the June 7th elections without Erdoğan’s leadership. On December 17, 2013, Istanbul Security Directory’s Financial Crimes and Battle against Criminal Incomes Department detained 47 people within a criminal investigation of bribery with the government officials. The investigation involved several key people in Turkish Government for an investigation on a millions of dollars of corruption. An arrest warrant was issued for 30 people by the public prosecutor on December 25, 2015, but the Istanbul Directorate of Security refused to make the arrests. Most people involved in the list of detainees and arrest warrant had connections with AKP or government officials, including the sons of three ministers. The investigation blamed several ministers for being involved in the bribery scandal. Simultaneously, phone tapes of Mr. Erdoğan, cabinet members and several businessman related to investigation were leaked through YouTube. It turned out the investigation was top secret in a way that none of the officials in the government were not informed, including the prime minister of the time, Recep Tayyip Erdoğan, minister of interior, other cabinet members and president the time, Abdullah Gul. Four of the ministers resigned from their positions following the allegations; however, none of them appeared on court thanks to their parliamentary immunity. Erdoğan and other government officials claimed the allegations were conspiracy against Turkish government to stop it from performing its duties, and overthrow the government. Erdoğan blamed Fetullah Gulen, a cleric, who used to be a close ally to Mr. Erdoğan, residing in the U.S.A. for forming a parallel state within Turkey. The fact that all the officers involved in the investigation were members of Hizmet movement lead by Fetullah Gulen strengthened Erdoğan’s claims. All of the police officers, prosecutors, and other officials involved in the investigation were suspended or relocated by the government following the detaining. Government officials claimed all the phone tapes and other proofs of the investigation were built-up recordings and paperwork and did not reflect reality and did not match with the other parts of the investigation itself. Turkey went through local authority general elections following those investigations on March 30, 2014, only about three months after the graft probe. Also, Mr. Erdoğan ran for presidential elections on August 2014. AKP received 42 percent of the vote in local elections and Erdoğan received 52 percent of the vote in presidential elections, which also showed people supported the government and Mr. Erdoğan in the graft probe allegations. Although AKP declared a victory at the local elections, and Mr. Erdoğan won the presidential elections in the first round, people were still not convinced about the case being closed. Turkey’s people wanted transparency in graft probe investigations as well as the following parallel state investigations. People expected clear proofs about the allegations’ being fabrications and attempts to dysfunction the government. Since the local elections in 2014, AKP government was expected to answer the questions raised in people’s minds. It has been over a year since the local elections, yet government’s accomplishments were limited in relocations and suspensions of the officials involved in the graft probe. AKP government has attempted many reforms to increase the level of welfare in south eastern part of Turkey where most of the Kurdish population resided. The government also passed laws entitling new rights for the people of the region as well as other ethnic groups living in Turkey. Those included TRT (Turkish Radio and Television, by government) started broadcasting in Kurdish in one of its channels; the national oath, which praised being Turkish, was removed from school system. All these reforms aimed to dysfunction Kurdistan Workers’ Party (PKK), a terrorist organization in the region since 1984, blamed for over 40,000 Turkish citizens’ killings in its terrorist attacks. The Turkish government led by AKP organized these reforms under a package called democratic initiative process. Since the last general elections, PKK ceased its activities in Turkey, and moved its armed forces to north of Syria and Iraq. In Turkey, a new party, Peace and Democracy Party (BDP), was established in 2008 as a part of democratic initiative process, and contested in elections in 2011 independently to bypass the 10 percent electoral threshold. Following the elections HDP was established in August 2012 following the People’s Democratic Congress. After the congress, BDP joined HDP prior to June 7, 2015 elections. HDP contested in June 7th elections as a party and contrary to several polls prior to election date, received 13 percent of the vote passing the 10 percent electoral threshold and won 80 seats in the parliament. Republican People’s Party (CHP)’s support for HDP against AKP in the areas where CHP does not have much support as well as HDP’s peaceful and democratic campaign received people’s approval, and it lead to a swift increase in HDP’s vote. Consequently, a historically high percentage of votes found representation in the parliament, and AKP could not reach the number of the seats required to form a government alone. AKP’s electoral agenda included many promises for what it wanted to do if it can form the government alone; however, it also included a revolutionary item that would change the Turkey’s democracy remarkably. AKP promised to amend the constitution, and change the parliamentary system into presidential system. It claimed that the current system did not allow the government to function efficiently, and suggested amendment of constitution and presidential system as the solution. Although many people agree that the Turkish constitution needs to be revolutionized, and are not fundamentally against the presidential system, both the tone of Recep Tayyip Erdoğan’s increasingly strong language, and his power expectancy deterred people from supporting AKP, in terms of reforms, towards presidential system. 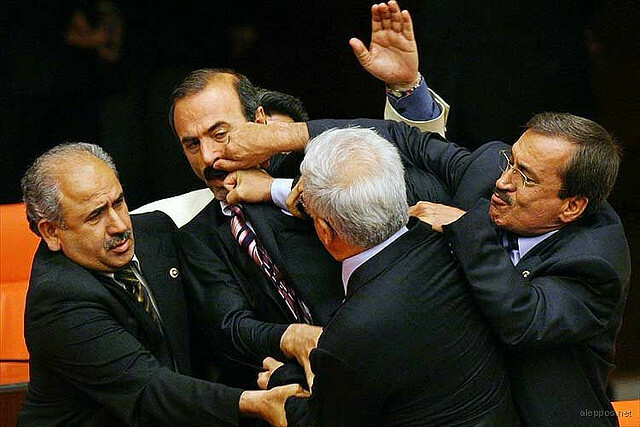 In his initial years of rule, Erdoğan’s rowdy style was somehow sympathetic to Turkish people. His authoritative attitude has been accepted and praised by his fellows as well as the public, as Turkey had been going through severe turbulence due to the lack of authority in government. However, Erdoğan’s tone increasingly became harsher and harsher both towards Turkey’s people (who criticizes him) as well as the international community. Kemal Kilicdaroglu, leader of the main opposition party- Republican People’s Party- called Erdoğan a dictator on several different occasions. According to Today’s Zaman, a newspaper published in English in Turkey, in one of those occasions Mr. Kilicdaroglu said Erdoğan fits the scholarly description of a dictator referring to the book “The Psychology of Dictatorship” by Fathali Moghaddam, a Georgetown University academic in his speech at the CHP group meeting. “Four criteria are used to describe a dictatorship: whether citizens can speak their minds or protest freely in city squares, whether there are fair elections in a country, whether minority rights are protected and whether there is judicial independence. Kılıçdaroğlu said Turkey fails on all four counts,” he said. Many international media outlets associated Erdoğan with becoming “the new Sultan of Turkey” in their headlines. Since he first came to power in 2002, Mr. Erdoğan’s attitude has always been somewhat harsh to any of his opponents, yet Turkey’s people did not want to take his increasingly heavy language anymore. A presidential system could potentially fulfill the titles Mr. Kilicdaroglu and international media outlets placed upon Erdoğan, even if this has not been his intention. After being elected as a president in 2014, Mr. Erdoğan’s new position required him to keep the same distance to all political parties as well as bureaucracy. Yet, soon after he took over the president’s office, he said he will continue to be in politics actively, unlike his predecessors in this position. Although legally Erdoğan was not supposed to be a part of AKP anymore, he continued to make propaganda on behalf of AKP during the election campaign process. He was giving speeches, and talking to the public on air almost every day through mass opening ceremonies, TV programs, meetings and various events using the presidential budget. Erdoğan asked for support for AKP by referring to the key items in its agenda: amendment of the constitution, and presidential system, which make him look like he was desperately looking to take over all the power to himself. As a president, Mr. Erdoğan was expected to keep the same distance to all political parties; yet his misuse of his authority on behalf of AKP was not appreciated by Turkey’s people. As a consequence, AKP did not receive enough votes and seats in the national assembly to form the government alone and turn its words into action, although Ahmet Davutoglu and his team won the elections.